We recommend that you give to your dog a good dry food specifically for puppies (which contains from 27% to 32% protein, with at least 15% fat), adding three eggs a week (cooked, raw red only) crust cheese and a scientific integrator (Fortiflex or Mesoflex or Controgen). We recommend that you give to your dog a good dry food specifically for puppies (which contains from 27% to 32% protein, with at least 15% fat) adding three eggs a week (cooked, raw red only) crust cheese and a scientific integrator (Fortiflex or Mesoflex or Controgen). It continues with a good dry food (which contains from 26% to 28% protein and at least 15% fat), continue with eggs and cheese integrator (always following the directions on the package). If you want you can switch gradually to a natural balance food. The integrator can continue up to 18 months. The pup must not jump in excessive way, must not quickly go down the staircases, must not make exaggerated movement. Being a dog of medium/ large size its skeleton must not suffer traumas. The pup must socialize since the first days, gradually bringing it in the middle of the people, just so you will have a clear and balanced adult. 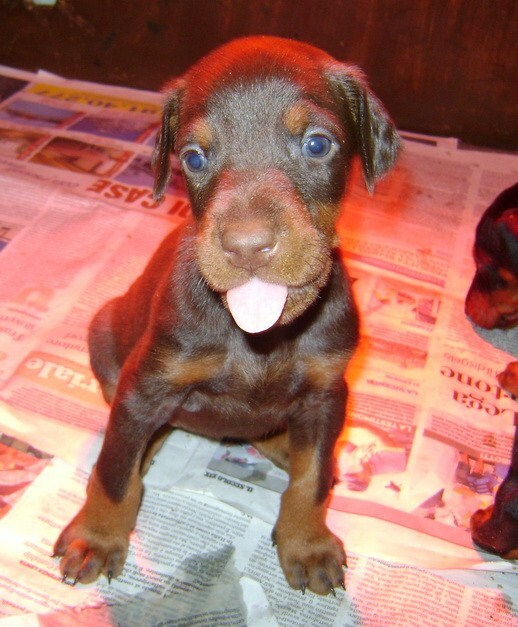 Dobermann in up to 12 months speaks exclusively to education, in our practice habits that the puppy will learn more easily if required we can contact. Avoid unnecessary urli but patience and consistency. The Dobermann was created to live with man, must live at home, can stay in a garden with adequate shelter, but a dog will always be distorted his true personality. It 'a dog that has a huge affection but requires a presence and a substantial commitment on the part of man. In a field training qualified young Dobermann should only do exercises began to socialize d sausage (attention to the change of teeth), so the formation of a security and shopping itself and people. A real training should never be started before 12 months and never using methods of coercion, among other things totally unnecessary. The Dobermann is learning very fast and should be made to work with the game or the premium, never forced. Problems sometimes arise with the Dobermann are almost entirely caused by a bad dog - the owner or by a weak presence at the side of the owner of the dog during the day. Finally last but not least, the Dobermann should never be linked to the chain. A good habit is used as a child in the appropriate carriers, useful in cars and even at home. © Copyright Carybdis. All rights reserved.